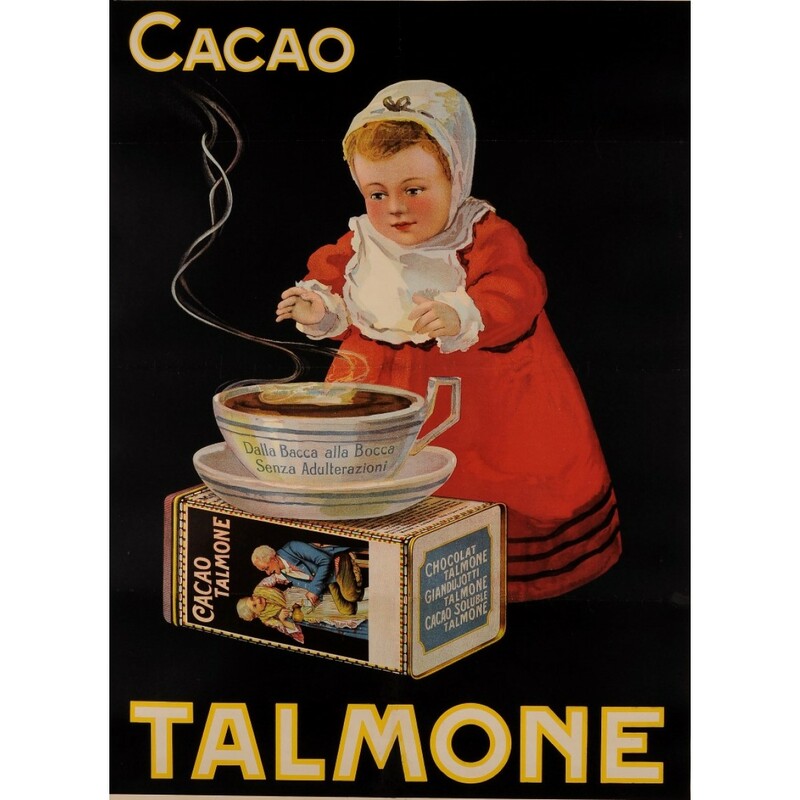 A most charming poster advertising the famous cocoa brand "Talmone", that was probably realized in the 1930's-1940's. This Cacao product was produced in Milano (Northern Italy) by the Talmone family. A baby girl is depicted here, very enthusiastic about the idea of sipping from this giant mug of fine hot cocoa. 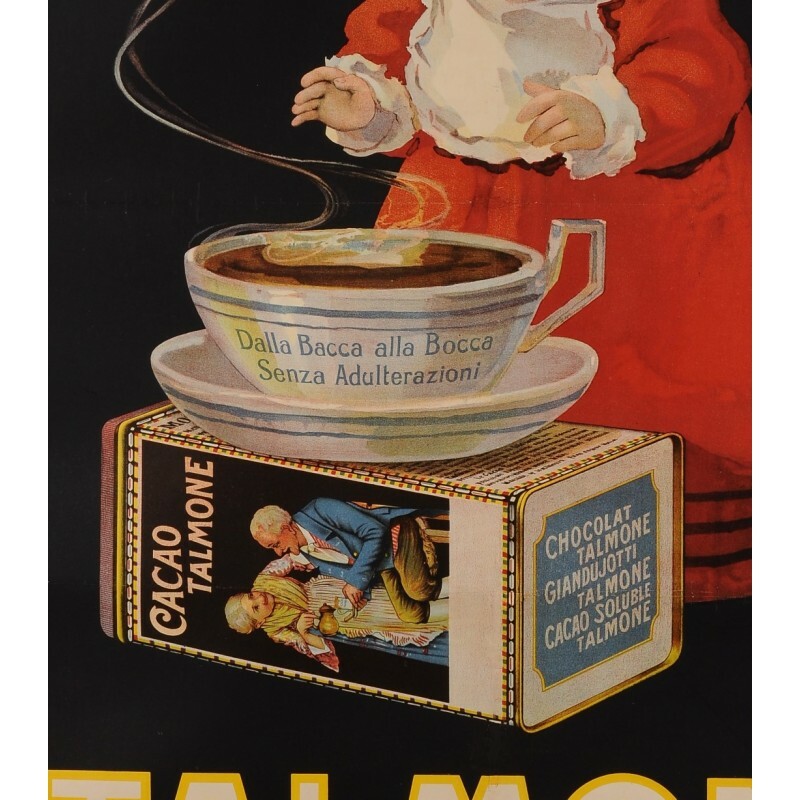 The giant tin box upon which the mug sits, features an homage to a canonical advertisement for the "Talmone", made by Ochsner in 1894. The touching picture of these two elders became well known at the time and contributed to the success of the Talmone brand. That original chromolithograph could also be found on our online store. This poster is from the collection of Chocolate Posters book by Israel Perry and Alain Weill p. 83. 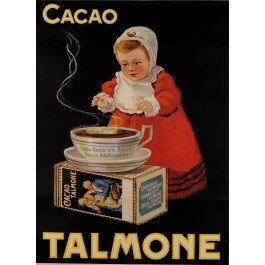 A most charming poster advertising the famous cocoa brand "Talmone", that was probably realized in the 1930's-1940's. This Cacao product was produced in Milano (Northern Italy) by the Talmone family. A baby girl is depicted here, very enthusiatic about the idea of sipping from this giant mug of fine hot cocoa. The giant tin box upon which the mug sits, features an homage to a cannonical advertisiment for the "Talmone", made by Ochsner in 1894. The touching picture of these two elders became well known at the time and contributed to the success of the Talmone brand. 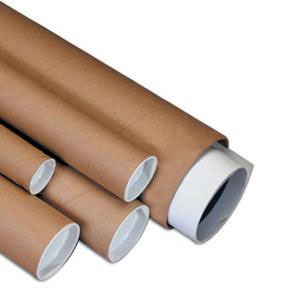 That original chromolitograph could also be found on our online store. This poster is from the collection of Chocolate Posters book by Israel Perry and Alain Weill p. 83.